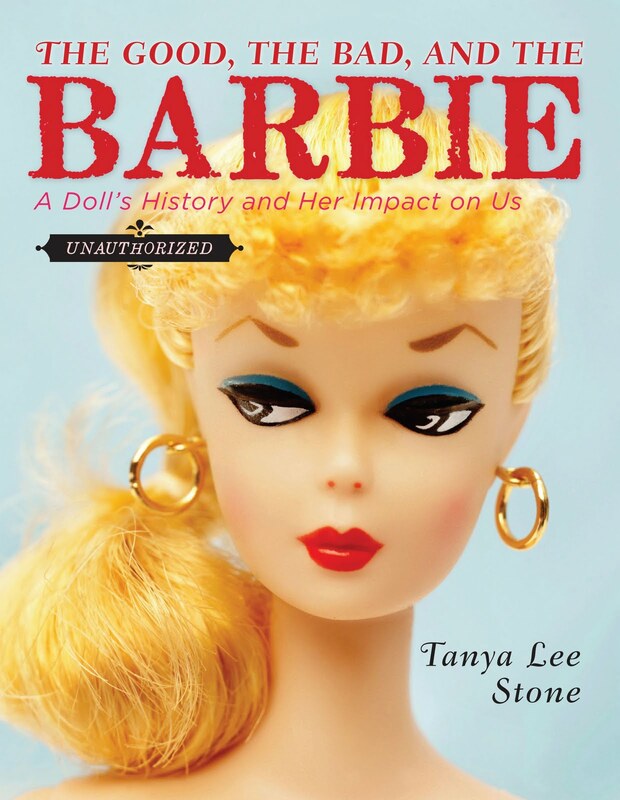 This month, Tanya Lee Stone launches her new book, The Good, the Bad, and the Barbie: A Doll’s History and Her Impact on our Culture. In this month's post, Come on Barbie, Let's Go Party, Tanya shared with I.N.K. the details of her launch party. Involved with the toy industry for over 25 years, Barbie has been near and dear to my heart. At Mattel, I originally interviewed for the position of Barbie accessories designer. Finally landing in the Girls Dolls and Plush Department, my office was next to the Barbie designers, who became my good friends. At first, I was worried that the book was going to be another Barbie bashing or, on the other side of the spectrum, full of Barbie fluff. 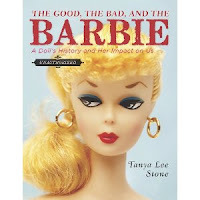 After reading The Good, the Bad, and the Barbie, I have to say "Bravo" to Tanya Lee Stone! The message that stands out to me is that girls can do anything. And, I believe that exact phrase was a Mattel advertising tagline one year. Ruth Handler persevered in so many ways - by making things work when everyone said no, by crushing the stereotypical '50s housewife image, by recognizing the new TV advertising medium, etc. Grandma cut off some of her own hair and glued it onto Barbie's private parts. Yup. This is how an adult saw Barbie - a grown-up mature woman. To me, Barbie was years of the best play imaginable. The creation of Barbie's life in my mind was priceless. The Good, the Bad, and the Barbie is a five-star interesting nonfiction read for girls of all ages. The flow of the book is seamless from the beginnings of Ruth Handler's imagination, through the process of Barbie's rising star. This includes the impact of the revolution of plastic manufacturing, the embracing of diversity, Barbie as an art form, and, of course, the controversies - peppered with fabulous, thought-provoking quotes from Barbie fans and critics. As a child, my Barbie play was a treasure-trove of stories and adventures. Barbie's house and town was a mixture of the family couch and lots of blocks and boxes. Barbie's clothes fascinated me - I loved her bright, blue patent leather coat and neon go-go dress. And, as for my self image, my mom told me that I was prettier than all the girls on her soap operas. Toy and doll history can be used in the classroom to support curriculum in Social Studies, and American and European History. Kids can relate to toys and dolls. Last November in my Play and Creativity in the Classroom presentation at the Chicago Toy and Game Fair, I shared with teachers how to combine toys and play with social studies, science, and math curriculums. In my I.N.K. post last year, Interesting Nonfiction and Toys, I shared a variety of toy-related nonfiction books. Last year when my ten-year-old son was having a difficult time picking an appropriate book for his class nonfiction unit, I handed him Toys! Amazing Stories Behind Some Great Inventions by Don Woulffson - now his favorite book. I say, give them something that they can relate to - and I know most kids can relate to toys... and Barbies. Have to mention that I was recently asked to act as Consulting Editor for Appleseeds Let's Play Issue. I'm also writing some extremely fun articles for the issue... almost doesn't feel like work. And, isn't that what it's all about? Having fun with whatever we do? One thing that many folks don’t know about me— unless they’ve seen one of my keynotes— is that I am a photographer. I’ve been taking photos since I was 11. Decades of travel have given me a library of 60,000 wildlife and landscape photos from Madagascar to Michigan. But until recently, they only appeared as small spot photos in my book. Words are a passion and I’ve been working professionally mostly in that realm; it wasn’t until scanners and iphoto became available that I could efficiently organize my photo content. Still, even though I’m now doing several books illustrated entirely with my photos, I’m not sure I’d say I’m a master photographer. I’d say I can get 98% on a photo. Solid focus, composition, inspired subject, and sometimes fortunate timing. But then, there’s that 2%. Ah, that last 2%. That’s what takes time–gobs of time. Most of a photographer’s time. What does that extra 2% look like? Take a peek at the kingfisher diving photos/article by Andy Rouse. Click on the photos to see larger versions of his exquisite work. The dripping bird clutching the fish. The water droplets. The water entry. Ahhhh. You are there. That last 2% is what makes a master photographer. That extra boost of quality is what takes the most skill and preparation and dedication. It’s the days/weeks/months spent in those waders, setting up blinds, studying behavior to catch just the right moment. Those photos are nonfiction dreams. They are beauty. I think lots of us, with our fancy digital cameras, great lenses can do such consistent good work that we’ve forgotten what GREAT work is in the photo world. 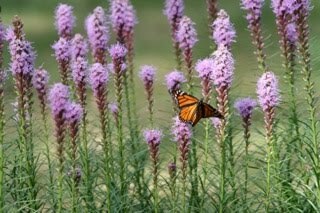 Sometimes I pause to look at the Outdoor Photographer’s Network (http://www.naturephotographers.net/) just to appreciate what photo artisans on this level can do. The group includes passionate amateurs and professionals; some of the photos are glorious. What does it take to get that extra 2% in the world of photography? Andy Rouse describes the work he did just to set up and photograph kingfishers on the nest in this article. And his preparations are relatively tame compared to the stories you hear about photographers trying to photograph elusive bears or cats. Jeff and I sometimes come across these same folks in far flung birding hotspots. Like us, they know the right time of year, the right marsh to photograph a Blackpoll Warbler, or whatever else is “in season.” They are putting in the time. Meanwhile, I am putting in my time, to do that extra 2% on my nonfiction writing. Oh, I can get to the 98%. Solid content, specific details, fluid writing. But the extra something—the voice, the surprising details, the joy, the propulsion in the writing—is what is sometimes elusive, even for seasoned writers like me. That’s where skill, passion, time, and pure doggedness are needed. In the last few days, my 2% has been some endmatter for a book no editor has seen, and perhaps no one will every buy. Who knows? It is not finished yet. I’m not letting it out of my hands until I can make it sing. Oh, that main text came in a great whoosh, like a gift, fully formed. But I want more for this book. I am weeks in, deep in to the endmatter: consulting world experts, experimenting with ultraviolet lights and magnifying glasses, emailing people in small towns in Wisconsin and Michigan who mentioned something on the Internet about . . . well, about the subject of my book. Here we go. I am diving in. Uh oh, distracted from that last 2%. Don't abandon ship! Focus. Focus. Finish! Wheatley was educated by her owners. She also learned the social graces of a proper white girl, became a devout Christian, and remembered virtually nothing of Africa where she was captured and enslaved at age seven. 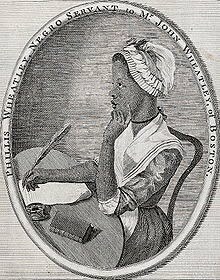 Phillis Wheatley was freed when she was nineteen, but still lived at the Wheatley mansion. Three weeks after her owner died, she married a bounder who abandoned her and their three babies (who all died in infancy.) Wheatley herself died in a squalid boardinghouse at age thirty. Many children’s biographies have been written about her and most of them focus on her triumphs. But in the world of adult scholarship, things aren’t so rosy. Since her death in 1784, her reputation has waxed and waned. She and her poetry were praised in the sentimental nineteenth century. Twentieth century feminists championed her for writing at all (her poetry is hard to take today,) while black activists vilified her as an early Aunt Jemima. Now, in the twenty-first century I want to tell her story and talk about how history has treated her. Henry Louis Gates, Jr., Harvard scholar and no stranger to controversy, has laid out the territory in his Library of Congress Jefferson lecture, published as The Trials of Phillis Wheatley. In telling her story I don’t shy away from her best-known, most-anthologized, and most-reviled poem, written when she was but fourteen. It’s easy to see why she was called “a colonial handerchief head” and “utterly irrelevant to the identification and liberation of the black man[! ].” But I see black pride in this poem too: black and white folks are equal before her God. Her gratitude for the “mercy” of slavery is harder to accept, especially when you look beyond her seat on the sofa in the Wheatley parlor. But hey, she was only fourteen. Later on, she wrote against her literal slavery, and called out her Boston neighbors who used the term as a metaphor. So, tricky subject with a controversial history makes life for this biographer more complicated than for earlier hagiographical writers who ignored these thorny issues. But it’s more fun too. The truth is I don’t have the complete history of civilization memorized. And what I learned in college is a lot fuzzier than it used to be. But the research skills I gained there are still very much intact. In my writing area, I have numerous books within arms reach to go to as soon as I need to remember or have a better understanding of something. Not surprisingly, many of my most often used reference materials are children’s nonfiction. Thinking about a new topic and want to put it in historical perspective? I always reach for Joy Hakim’s A History of US. It’s beautifully written and will inevitably tell you what you want to know and something else you hadn’t thought of before. (If anyone is looking for a holiday gift for a favorite blogger, I’d love the complete 11 volume set. For now I make do with a couple of volumes and a trip to the library). I always seem to have yet another question about a President so I use Presidents. A Time for Learning Book by Melissa Blackwell Burke. I think I haphazardly picked this book up on sale in a Target or Kmart but I’ve had it for years and pull it off the shelf often. My American History Desk Reference by Scholastic is a used copy I scooped up for $4.95 on a wonderful trip to Powell’s bookstore in Portland. Tons of everything one needs in here, including a fascinating facts column for each state. Yes, I sometimes read those just for the fun of it. I’ve lent out Kathleen Krull’s A Kids’ Guide to America’s Bill of Rights several times but I’m very persnickety about having it returned to me. Although people would like to believe that three years of law school means that a person can knowledgably answer any question on American jurisprudence that is unfortunately not the case. This book certainly helps. I also use children’s nonfiction for everything from knitting, to crafting, to word synonyms. These books fill my shelves and provide much of what I need to stuff the knowledge gap. I have another book on my shelf, one of Eleanor Roosevelt’s biographies entitled, This I Remember. For me, that would be a much bigger problem. UPDATE: One of the commenters on this post pointed out that Amanda Gignac was badly misquoted, or quoted out of context, by the New York Times in the article I refer to. Apparently, her misquote has been perpetuated widely on the internet and I am one of the perpetuators. I hereby offer my apology to Ms. Gignac and I will delete two somewhat sarcastic remarks I made in the original version of this post. Her account of what happened and her commentary, can be found on her book blog, The Zen Leaf: http://zenleaf.amandagignac.com, and I urge you to read it. Despite the unfortunate aspects of this kerfuffle (Ms. Gignac's appropriate word for it), and without meaning disprespect singled out at any individual, it does remain the case that the push for higher test scores and faster achievement in reading has taken a toll on the attitude toward picture books held by many schools, parents and even children. Many of us find that to be a disturbing and counterproductive trend. The title of the article is "Picture Books No Longer a Staple for Children" but that title understates the purported demise of the picture book. Not only are sales way down and shelf space in bookstores vastly diminished, not only are publishers cutting way back on the number of picture books they're willing to publish each year, but parents are forbidding their children to even peek at the nasty things. That's right, there are parents out there -- plenty of them -- who seem to think that picture books are hazardous to their child's intellectual health. For example, we get to meet Amanda Gignac, who writes a book blog, and whose son started reading chapter books at 4. At 6 1/2, Laurence is forbidden to regress in his reading. "He would still read picture books now if we let him," says the boy's mom. But, according to the New York Times, both parents are firm in their mission to allow only chapter book. But wait a minute... there is one other thing we get to learn about this boy from his mother: "He is still a 'reluctant reader.'" Well, in their comments, readers of this article excoriated the attitude held by parents such as the Gignacs. I had expected people to pay tribute to some of the unforgettable picture book characters that we all know and love, characters we would hate to have grown up without. But most of the comments focused on the benefits of the pictures in picture books, how they aid in the intellectual and emotional development of children, how they open up worlds of imagination and thought, and how a childhood without them would be an impoverished childhood. I have no disagreement with any of those sentiments. But for a moment let's forget about the splendid illustrations and beloved fictional characters we'd have to kiss good-bye in a world without picture books, and let's mourn the loss of non-fiction picture books. Not the illustrations and photographs -- magnificent as they often are -- but the concepts and text. Let's imagine a young child like Laurence Gignac totally deprived of them. Here's what I want to know: If he were limited to non-fiction literature outside the picture book section of his local library or bookstore, if he shunned all those big, thin books with pictures in addition to words on every page, would his intellectual capacities develop more rapidly or less rapidly? Comparing the picture book world of non-fiction with the low- or no-picture book world, is the only difference in the reading level? Or is something else missing in that pictureless world? Here is where I want your help. I think we should compile a running list of non-fiction picture books that have no counterpart whatsoever in the other, more "grown-up," world of chapter books. My hunch is that for every author of this blog, there are oodles, and the same for the zillions of other excellent books by other excellent authors. I'll get you started with one of my own, and then it's going to be your turn. I might as well pick my first book, How Much Is a Million? It's celebrating its 25th anniversary this year and it's still going strong in both hardcover and paperback (and in a number of languages). I guess somebody must be reading it! The book offers mind-bending ways to picture the numbers one million, one billion and one trillion and gives the reader concrete ways to wrap their minds around the difference in magnitude between those three oft-used but poorly-understood big numbers. For example, if you counted non-stop from one to one million, it would take you about 23 days ... if you counted non-stop to a billion it would take about 95 years ... and to a trillion you'd be at it for 200,000 years! Big diff, eh? Can anyone show me a chapter book that would lead precocious children to a better understanding of what happens to a number when you put three zeros after it? Does such a book exist? If so, I haven't seen it. Interestingly, since my book came out, a few other authors have tackled similar material in fascinating, original ways. But they're all picture books. So how about if each reader of this blog (including but not limited to the authors of this blog, who need not be shy about pushing their own books) chimes in with just one example of a non-fiction picture that contributes to the education of its readers in a unique way that has no parallel in the world of more advanced chapter books. We'll put together a list, just to keep track of what humankind will be missing if the portentous trend described in the New York Times continues. We may not have any new picture books, but least we'll have our list! orchestra. Standing at the podium, hearing the music surrounding her, she said, was an extraordinary experience. I must admit I was a little jealous. I mean I could do that. Stand up there and read one of my books. I could listen to the sound of violins and cellos and flutes washing over me. How wonderful would that be? Alas I hadn’t written a book that would qualify for such a thing. But from time to time I thought about Debra and her story. Remembering it gave me a vicarious thrill. He was enthusiastic about the idea, as one of his interests is showing audiences the way the arts interconnect. Two years from that serendipitous meeting, Ballet for Martha was presented with the St. Louis Symphony performing Appalachian Spring. Brian Floca’s illustrations appeared on an overhead screen. We were all there, Sandra, Brian, and our editor Neal Porter. It was exhilarating! In November there will be four performances for younger audiences of Appalachian Spring, along with the narration and images from Ballet for Martha. I guess you’re wondering if I will be up there narrating. Well, no. David, himself, will read excerpts from the text with the images overhead. 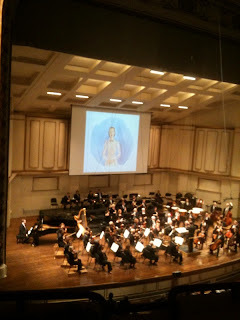 The orchestra will play fragments of the music as they relate to the story, followed by the complete symphony. As for me, I’ll be sitting happily in the first row with my grandchildren and humming along. But I’m working on the next performance, which will be in Aspen, Colorado next summer. Maybe that will be my big chance!!! My post this month is going to be a tad different than usual because I firmly believe that every milestone in this tough business of ours should be celebrated—and that’s exactly what I did last night. Celebrate. You may think that nonfiction books and a rockin’ party don’t go together—but you would be wrong! Last night was the official launch party for my new book The Good, the Bad, and the Barbie: A Doll’s History and Her Impact on our Culture. And let me tell you, people were In the House to celebrate nonfiction! The place: Flying Pig Bookstore in Shelburne, Vermont. The time: 7:30 p.m. on a Wednesday evening. Even after a long day of working, shuttling kids to play rehearsals and soccer games, nonfiction aficionados showed up to usher in this newest addition to the Dewey Decimal shelves. There were parents, teachers, librarians, and kids armed with questions (as well as a few Barbie dolls). Who says nonfiction is dead? Phooey! On hand were Karen Pike--the photographer I hired for the bulk of the interior images--and Peter Harrigan--the theatre professor/Barbie collector who made the photos possible. The questions from the audience were fabulous. We talked about writing process, how do you know when it’s time to stop your research, and the many, many cultural questions that come up when people start to talk about Barbie. Although I actually anticipated and dreaded this questions several months ago, now I really enjoy it. Why? Because the question is at the heart of why any nonfiction writer (any writer, really) chooses to write about a topic—and why they are the right person to tackle it. It opens up all kinds of avenues for thought and discussion. Yes, I often write what might be called feminist books, or books that have at the heart of them a desire to empower girls. And yes, on the surface, the topic of Barbie seems at odds with that. But that’s what’s so fantastic about immersing yourself in a topic of nonfiction, looking at the back story, discovering the who, what, why, where, and when of a topic, looking at it from all sides and ultimately synthesizing an understanding of it. I won’t give away what my conclusions are, lest I be accused of treading into Spoiler territory. But I will tell you that every time I answer the question of “Why, why, why, would YOU of all people choose to write about Barbie?” I am rewarded with the facial changes, head nodding, and verbal feedback that indicate I have made a connection with my audience. I have expressed myself. I have initiated a thought process out in the world that leads to discussion. This is why I write nonfiction. And THAT is definitely something to celebrate. So come on Barbie, let’s go party! I should resolve to never say never and avoid any future dining upon my own verbiage. Anyway, I joined Twitter in September on a vague impulse. It soon turned out to be a fun way to find all sorts of links to interesting things and interact with people that might be difficult to find otherwise. As a newbie there’s a great deal I don‘t know, but already Twitter is proving to be an excellent way to find the “headines” and online resources in my interest areas. Tweets may be queries, requests, announcements, observations, mini-rants, or whatever else people want to say in 140 characters or less. Chats such as #edchat are a scheduled event during which bunches of Twitter people chime in on a particular topic. Recently I participated in a #mathchat on the topic “Does ‘mathphobia exist - how do we deal with it?” that garnered quite a few participants. I get the impression that some people use the “chat” hashtags all the time, whether a chat is actually going on or not. If you haven’t already taken the plunge, try Twitter and see how it may fit into your online experience. And please feel free to follow me @LoreenLeedy. I had the pleasure of attending and the privilege of speaking at the Rutger's One-on-One Plus Children's Literature Conference this past Saturday. It's a wonderful conference, and I always learn a lot. For example, there was a great panel on social media, given by Deborah Sloan, Alvina Ling, and Katie Davis. If you want to read tweets about the conference, follow #rcclbuzz. I was a mentor to a young woman who is working on a non-fiction picture book. She has a great idea, but is struggling with the form. (Or at least I think she is!) As I sat there giving her advice, I realized that the advice I was giving her was advice that I am giving myself as I dive deeper into a huge nonfiction project that has me at times excited beyond belief and at other times terrified beyond beyond. In fact, the advice I was giving her, as well as some tips I wanted to give in my speech (I ran out of time), are kernels of wisdom I have gleaned from others over the years. Although I have written this post to writers, I am hoping that teachers and librarians can use it with their students, not only to help them with their writing, but also to help them read and analyze books. Why did the author choose this format? Why is it a picture book? Middle grade? YA? Why did she structure the book in the way she did? For example, why did she start in the middle of the story and work backwards? What is the climax of the story? Did that happen in the middle of the story or is it just in the middle of the book? Why are there sidebars? Photos or illustrations? And of course, what sources did she use? How did she get her stuff? *Isaac Bashevis Singer asked himself a series of questions before he began to write any book. Although Singer was a preeminent fiction writer (if you haven't read him, please do), I think his questions are essential for narrative nonfiction as well. Here are his questions: Is this a story with a beginning, a middle, and an end? Do I have to write this story? Am I the only person to write it? I think if you answer yes to the first two, you should write the book. If you can also answer yes to the third one, you should write the book and feel blessed the whole time you are doing it. *Recently I read a fantastic interview with John McPhee in the Paris Review and he added to that advice: "Structure is not a template. It's not a cookie cutter. It's something that arises organically from the material once you have it." If you want to read some more John McPhee brilliance, go here. And better yet, buy or borrow the hard copy because I'm not sure it's all on line. He talks, in this article, about what to do if you are reporting something and the best thing happens at the very beginning of your reporting. This could happen, and has happened to me, in researching history as well. You can't change the order of how things really happened, but you can structure your book or article in the way you want to so that the exciting thing happens where you want it to. *When you find yourself trying to make stuff up in non-fiction, it means that your story isn't deep enough. You don't deepen it by adding a fictional voice, you deepen it by doing more research. I told my "mentee" that for a picture book of 1,000 words or so, she might have fifty pages of typed notes from her research. Strong young woman, she, she just kept nodding. There were no tears (thank goodness). *I leave you with this; it's a window into my world right now and is just another way of looking at this process. For my new project I read a memoir by an early 20th century policeman. He wrote: "I've always gone to a sudden death prepared to regard it as a possible murder. But I don't go with the conviction that I've got to make it a murder, and there's a wide distinction. The years have shown me that no officer has the right to accept the first evidence as conclusive." I have to go now, and see where this project is going to take me next. Let's hope it's not down a dark alley. Dear John Adams, you've got a birthday coming up, on the 30th of this month, to be exact. On the 19th, by the old reckoning, set aside when you were not quite 18. It will be your 275th. Wait – let me imagine the glorious light of 275 candles, set into a spice cake, and the breath required to extinguish them. Make a wish, I'd hope you would, for this governing machine that you helped to invent, this ongoing experiment in participatory democracy. I'm imagining what an old Braintree lawyer/farmer/orator/public servant such as yourself would make of the republic for which you and your 'Dearest Friend,' – please pardon me the liberty for thus referring to Mrs. Adams – gave so much. I'm imagining what you'd look like now. I'm thinking of Sam Jaffe as the remarkably well-preserved High Lama in the 1937 Frank Capra film, Lost Horizon. I doubt you'll read this, having other things to do in the Blue Beyond, but you might wish to know that, though there's no great stone monuments or temples to you in Washington, D. C., you've been the subject of many a heartfelt book, including a couple of mine. More about them later. I was introduced to you, your ebullience and stubborn earnestness in a fine work of historic fiction, Irving Stone's Those Who Love (1965; A book club sent it to my folks when I was 14.) and in Catherine Drinker Bowen's 1950 biography, John Adams and the American Revolution, found in a used bookstore. These as well as Jos. J. Ellis's The Passionate Sage (1993) and David McCullough's John Adams (2001), but how about books for young citizens? 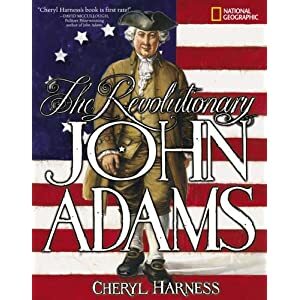 There's John and Abigail Adams:An American Love Story, by Judith St. George (2001); certainly Abigail Adams: Witness to a Revolution, by my friend Natalie S. Bober (1998); and this year's handsome Picture Book of John and Abigail Adams, written by David A. Adler, illus. by Michael S. Adler. But allow me to write a bit about how I went about writing and illustrating the pair of books I did about the Adamses. In 1994 Bradbury Press published Young John Quincy (Out of print it's been for years, the title being unclear and the world being unfair, as you well know.) It was followed nine years later by The Revolutionary John Adams (National Geographic). The happy problem, in the latter, was distilling your long adventurous life into 48 pages. I pored over said bios along with Esther Forbes' book about Paul Revere - excellent for the feel of your time and place. Not being able to go to your time, I did manage to go to your place, your house, which still sits beside your folks' house, in which you were born. They were farmhouses in the 1700s. Folks walked or rode their horses or jostled along the country road between Boston and Plymouth. Now they're surrounded by every sort of business, jammed side by side in modern Quincy, Mass, cars, trucks rumbling by. Still, a big fat thrill it was to walk about in your quiet, empty house, straining to imagine your family there, especially in those months and years that you were away. I drew out a floorplan. I drew out a grid: 48 squares and planned out the pages, envisioning which part of your story would go on each page. 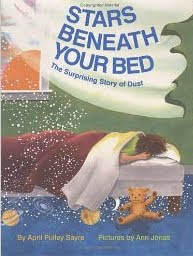 Such a book as this, I was telling a bunch of kids just day before yesterday, is an imagination/education combination. In the outlining, one is already imagining the writing. It took me a couple of weeks to write. One must be accurate, concise, and engaging. Make it snappy. The illustrations took ever so much longer. They always do. I studied the paintings and engravings of you, your times, and books about clothing and transportation, as these were fashioned in the 18th century. I set to drawing, in pencil on tracing paper, on which I'd drawn the margins. Reference books clamped open with bulldog clips, propped on the edge of the table, an old oak library table (used furniture store in Colorado Springs.) One has to write first, I tell kids, so you know what the words say AND so you know how much space the words require on the page. It's as if you're choreographing a dance between the words and the pictures. I photocopy the drawings. Mr. Adams, how you would have reveled in the ease of a copy machine! I tape the copies together into a dummy, transfer the drawings to illustration boards. Watercolor. Ink. Colored pencils. I use them all, mostly the paints, each painting taking a full week of 12 to 18-hour days. In particular I remember your book, Mr. Adams, of all the books I've illustrated. There was an ice storm, knocking out the power for 8 days. I'd have to heat up my hands in warm water to keep on painting and knock off work when the sun set - all the better to appreciate your efforts! In any event, that book seems a long time ago. It was, from my vantage point. Long, long, longer ago are you, but you're still fresh in my imagination. Honored I would be if some young American would discover you in a book of mine, but if they'd understand their nation and its beginnings, find you they must, in whatever book. After all, your story and the stories of all your countrymen and women are each chapters in the story of the republic. Happy birthday, dear John Adams. May you not be forgotten. “Leaving the lights on won’t actually kill a polar bear.” This headline for a column in the July 4, 2010 issue of the “Washington Examiner,” a free daily paper found at most DC Metro stations, caught the eye of a friend of mine. She tore out the column, scribbled “here’s another view” at the top of the page, and left it on my front porch. It’s got me a little worked up. It’s not every day you see the word “iniquitous” used to describe the motives of children’s book authors. 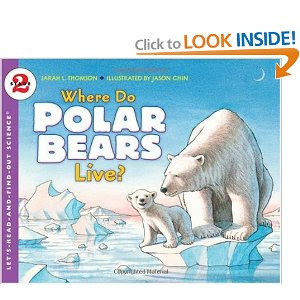 One of the nonfiction books Gurdon singled out was Sarah L. Thomson’s “Where Do Polar Bears Live?” Part of the Let’s Read and Find Out Science series (suggested ages 5-9), this book had the effrontery to state that “If the Earth keeps getting warmer, the summer ice in the Arctic could melt completely by the time you grow up.” Seymour Simon’s latest collaboration with the Smithsonian, “Global Warming” (ages 5-9), earned Gurdon’s contempt for its cover, a breathtaking photograph of polar bears walking through melting ice. Iniquitous? Thomson is a respected children’s book author. So, of course, is Simon, who according to Kirkus “may have done more than any other living author to help us understand and appreciate the beauty of our planet and our universe.” Based on my own experiences writing about global warming, I expect that Thomson and Simon went out of their way to AVOID “transferring their anxieties” to their young readers. 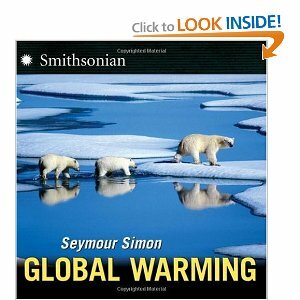 The more research I did, the more experts I consulted, the more knowledgeable I became about climate science, the more concerned I became about the rapid changes happening to our world right now, but I was still determined not to let my book be depressing and alarmist. The last thing I wanted to do was make global warming seem so scary that kids would feel hopeless about it. So I labored to explain the subject clearly and calmly, and to acknowledge that while climate change poses a serious challenge to people and other creatures around the planet, it’s also an opportunity for human innovation. I wanted to help kids feel empowered, not threatened, and I'm sure Thomson and Simon do, too. I’m a mother, too. I understand the powerful instinct to protect one’s children. But I think Gurdon is underestimating kids, their optimism, and their ability to understand the basics of science, including climate science. Furthermore, after perusing some of her other columns, I suspect that Gurdon’s skepticism of global warming—and her criticism of these books and authors--is based less on an understanding of climate science than on her politics. But let’s put that debate aside for the moment. Accusing people of evil because they write about a topic that you find too controversial? Well, that’s just…sad. And turning the lights off when you leave a room? That's just smart. A great new web site. Ms. Frizzle tackles global warming! Fall is here, and like a lot of other people I know, I’m going back to school. Only for four days, but still: I’m a tiny bit nervous and a whole lot excited. I even went back-to-school shopping for my first ever laptop (shiny!) and a new pair of jeans (comfort stretch). The class I’m taking, “Editing for Writers,” taught by Stephen Roxburgh, doesn’t even start until this weekend, and yet I already have homework. I’ve been mulling all day: how to describe, in one paragraph, what the “core story” of my novel is—not a plot summary, mind you, but something much more challenging. It’s the same question I ask myself every time I embark on a new picture book biography—not what happened, but what is the story about? One of the greatest challenges of writing narrative nonfiction, I’ve found, is that it’s not always clear at the beginning what shape the story will take, and I think it’s crucial to approach the material with an open mind. It takes a certain amount of mucking about and slogging through research material before the hint of a storyline emerges (since, after all, you can’t simply make stuff up). Certain themes seem to resonate with what you’ve been reading. It becomes easier to take step back and see how a character’s actions illustrate those themes, and then the beginnings of a story come into focus—a story about something. I’m heading to class with the first draft of a novel, but I fully expect to apply what I learn to future narrative nonfiction projects, as well. I’ll report back next month what I learned. 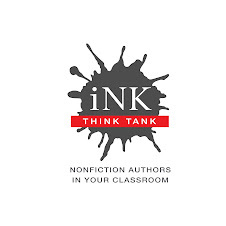 We nonfiction writers often puzzle over the prejudice many teachers have against nonfiction. Sometimes these are so strong that they won't even allow a child to read a nonfiction book for credit or use one for a book report. One reason for this makes sense at first. Most of the school day, they will say, the children are reading fact after fact as they study math, science, social science, and grammar. They need a break. They need reading that will stimulate their imaginations. Sounds good, doesn't it? Let's give the kids something to read that's different from what's required of them. Facts aren't all that matters in a good education; exercising the imagination is also important, and novels are what do that. But wait a minute--what's wrong with this picture? For one thing, where do the ideas for fiction writers come from? They come from the real world, from real events, things that really happened. And think about science fiction--it's a wonderfully imaginative genre that takes its inspiration from real scientific discoveries and inventions. Some people prefer to call nonfiction books "informational books." I agree that the word "nonfiction" can have a negative sound to it--it says what our books are not instead of what they are. But "informational" sounds plodding and boring, and our books are far from that. "For more than two years, your diet will be limited to a few items.......You will work so hard that you can easily gobble down a meal of nine pounds of meat. Many times you will go hungry. You will be completely out of touch with family and friends except for one chance to send, but not receive, letters after the first winter." A mathematically inclined reader might think for a moment, then realize--wow! Nine pounds of meat--that's 36 Quarter Pounders! The child who is constantly visiting his Facebook page and texting on his cell phone may wonder--how could I survive not being able to contact my friends? These kinds of reactions stimulate the readers imaginations to take them places mentally and emotionally that they have never been before. "Dust can be bits of unexpected things--a crumbling leaf, the eyelash of a seal, the scales of a snake, the smoke of burning toast, ash from an erupting volcano.......Old dust stays around. Dirt that made King Tut sneeze is still on Earth. It might be on your floor. That dusty film on your computer screen might have muddied a dinosaur." Now that's writing that will stimulate any reader's imagination! 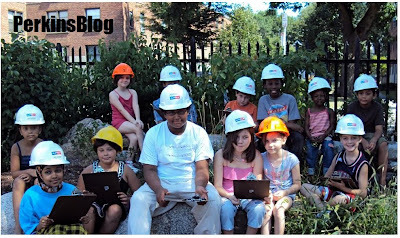 One final point that has been brought up before in our blogs--there are children out there whose imaginations are more stimulated by nonfiction than fiction. They may even put down fiction as "just made up stories" and only be interested in reading about "real" things. If one goal of education is to help children develop a love of reading, then not allowing these children to read the kind of books that they find interesting can only work against this goal we all share. The last time we chatted (see my 9/14 I.N.K. entry) I had followed my inner voice -- that muse inside my head who guides me through the writing process by asking questions, making endless comments and suggestions, and nagging me constantly about this thing and that -- and wound up with a 311 page text about George Washington's first six months as commander of the Continental army. For kids 8 to 12 years old! This would never do, of course. Not only was the text wildly long for the majority of my intended readers, it was 200 pages over the contracted page limit. Yes, I had known the text would come in long for many, many months, but I'd continued pushing the text forward to work out the book's themes and overall structure. Besides the writing was going smoothly and I wanted to see where it would lead, especially with regards to the dramatic action sequences. So it was all my own fault -- and don't think my inner voice didn't let me know. Every so often, it would suddenly blurt out, "Just be ready to delete a lot of this stuff, Murphy." When I finished I wasn't in a panic. Well, not a big one anyway. I knew I had a great deal of work to do and knew it would take time to accomplish. So I took a deep breathe and launched into the revision. At this point my # 1 priority was to cut as much of the text as possible without completely destroying the narrative story line and flow. I did what every writer does: I read each sentence carefully and analyzed it to see what needed to stay and what could go, cutting a word or phrase here, a paragraph there. Some of this was quite easy. There is always excess fat that needs to be trimmed. Some deletions were more problematic. I might slash a paragraph and feel fine about the decision, only to realize later that the paragraph set up a crucial scene and needed to be restored. After going through the entire text once, I went back for another try at it, ax in hand and ready to chop. When the dust finally cleared, I sat back to look at the text and was shocked by what I found. After weeks of work I had managed to cut the text by a measily 7 1/2 pages! Now the panic set in for real. I had focused on cutting the text and had pushed the delete key hundreds and hundreds of times. I thought I'd been brutal on my writing, had attacked it with single-minded purpose. But the manuscript was still over 300 pages long. What had gone wrong? It took several days, but the answer finally came to me. I had fallen into a common writer's trap. During the initial writing phase, I had lived with the text for months on end, had read over and massaged every word, every line, and every paragraph numerous times to get the text just right -- and I'd fallen in love with what I'd written. I couldn't see the flaws, so I couldn't devise a solution. Didn't want to really because I thought I'd already worked out all the problems. In effect, my inner voice -- that ever present critic I counted on to help me make the text as perfect as possible -- had followed me down this path as well and couldn't really point out the problems or a solution either. What to do now, aside from panicking completely. Here a more rational and calm voice finally chimmed in. Clearly, I had lost the ability to view my text with perspective; logic suggested that the best way to get my perspective back was to put as much distance between me and the text as possible. I needed a vacation from my words, and not just one that lasted a few hours or even days. I needed to get as far away from the manuascript for as long as possible. At this point I decided to enlist my editor's help. I sent her the manuscript, told her it was too long (as if she wouldn't see this immediately), and that I could use some guidance on what to cut. Then I went on to work on other projects and whenever I thought about opening the George Washington file I used every ounce of will power I had (with help from that inner voice) to resist the temptation. Several months went by like this until my editor sent me an e-mail. She had no specific suggestions on what to delete; her only guidance was to "keep the focus on George. He's the star of the show." This wasn't the kind of advice I'd expected. I guess I'd felt so clueless about what to do that I'd hoped for a more speciific blueprint. Which was when it dawned on me that she had actually done just that. I opened the George Washington file and began to read what now felt like someone else's manuscript. Which was a good thing. My inner voice was chattering away, saying over and over, "Keep the focus on George." And whenever the focus drifted away from him even for a second, I highlighted the section and pushed delete. Over and over and over again. At one point I deleted an entire chapter (where British officers discussed military tactics and their views on Washington). Push, delete; push, delete. It wasn't easy sending away great chunks of what felt like a beloved child, but it had to be done no matter how painful. And this time when I viewed the results, I was almost as shocked as after that first failed revision. This time I had whittled the text down to 74 pages! It wasn't finished by a long shot. The text would require months of intense revision work. But eventually a much more compact and focused narrative emerged that would become THE CROSSING: HOW GEORGE WASHINGTON WON THE AMERICAN REVOLUTION. Despite this near disaster, I haven't given up on listening to my inner voice; it's been a faithful and accurate guide for too many years. But I do sit back in my chair from time to time and think about where its advice might take me. And sometimes if it seems like it might be a long, intricate journey, I close the file and take a little vacation before making a decision. First things first—a shout out to Linda Salzman. Just as we must become parents to appreciate our mothers and fathers, I now understand the effort our blogmaster has made to keep I.N.K. running smoothly—from pinpointing the visitor counter as the culprit that gummed up the other software to making sure posts were scheduled and published. This is no easy task. Thank you, Linda. I have come to this new realization because I’m now a blogmaster myself. This year I’m the author-in-residence of the Michael J. Perkins Elementary School, which is right in the middle of Old Colony Housing Project, which is right in the middle of South Boston. For those of you who don’t live in Boston, perhaps you remember the huge fights in our city about desegregating the schools in the early 70s. Southie, primarily an Irish-American neighborhood at the time, was right in the thick of it. Others of you might have seen Clint Eastwood’s Mystic River; its story took place in South Boston. Ben Affleck’s movie, Gone Baby Gone, was filmed in Old Colony. Times have changed in many ways. Some of South Boston has been gentrified. The kids who attend the Perkins School look like an assembly of the United Nations. But Old Colony still has the red brick institutional design that labels its residents. Soon that’s going to change too. Stimulus money is bankrolling Phase 1, taking the first part of Old Colony down and constructing zero energy buildings in its place. 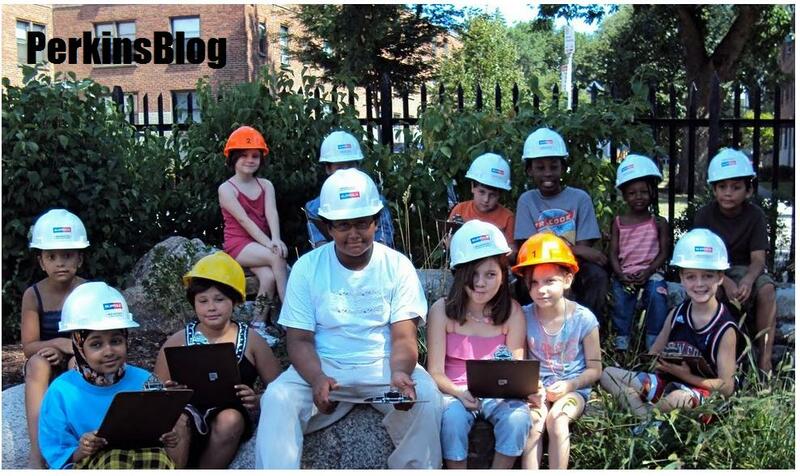 The Perkins School is literally across the street so its students have the best seats to watch the show—to find out about construction and sustainability, to think about their community and their relation to it, to learn to write about it. Hence the blog, hence the author-in-residence, hence me. The day before school started, I went to a meeting of all the teachers. Most of it was about bus schedules, etc. But principal Barney Brawer also talked about how this massive renovation could double as a living museum, offering lessons in science, math, and writing to children in every grade. Then I talked about ways I hoped the blog could fit into curriculum and classrooms, and the thrill of having one’s work published for all to see. Later a teacher came up to me and said, “You know what excited me most about your suggestions? You mentioned brainstorming with the kids about who they can ask to get answers for their questions, then actually talking to these experts. That’s a whole new idea for them. It’s something they need.” Her comment made me very happy. So come visit the PerkinsBlog, subscribe even. Some day I’ll figure out how to install a visitor counter without gumming up the works. Instead, Savage and his husband posted a video titled “It Gets Better” on YouTube and invited others to do the same. The response has been overwhelming. Within 10 days there were hundreds of videos from adults of all ages and ethnicities in the U.S. and abroad. Posters included recognizable gay and gay-friendly bloggers, actors, and musicians. But most contributors were “ordinary” men and women who wanted to bear witness to the experience of growing up gay or lesbian in a world where adolescence is an emotional whirlwind and any perceived weakness can leave a person vulnerable to attack. One poster said he was beaten so violently in high school that he’s been confined to a wheelchair since. But even those who escaped long-term physical harm bear emotional scars from verbal abuse and fears that they were letting down their parents or committing sins against their god. Taken together, the videos paint a vivid picture of what life was like for many gay and lesbian teens in recent decades, a picture that it would be difficult for one filmmaker or one author to put together alone. The fact that so many people seized the opportunity to tell their stories and reassure young people that “it gets better” is a poignant example of a community finding its voice. Before the Internet redefined community in this way, it was every man and women for him/herself.” When I was questioning my own sexuality in the 1970s, there were just a handful of books available and hardly any depictions of healthy lesbian relationships on film or TV. The first positive portrayal I remember seeing was “The War Widow,” a 1976 PBS teleplay set during World War I, in which the lonely wife of a soldier falls for a bohemian photographer. Though the most risqué physical contact between the two women took place when one put her hand gingerly on the other’s shoulder, their candid talk of romantic feelings was a revelation. It was around that time that People magazine ran an article on British tennis champion Virginia Wade, referring to her “constant companion,” a woman. I’d always loved watching Wade on the court; she had the first really powerful serve in women’s tennis. Now her success—she won Wimbledon in 1977, as well as two other Grand Slam singles titles—reassured me that even though I was different, I could aspire to anything I wanted. It also fueled my interest in women’s sports as a focus for my research and writing. Female athletes inspired me in general, but I sensed that this was an area where I might learn about others like me. Things are so different in 2010. LGBT issues now are front-page news and many gays and lesbians are out and proud. But that doesn’t necessarily mean growing up gay is easier than it was in the ‘70s. When I was a kid, the hate speech was whispered because people just didn't speak about homosexuality. Today it's shouted in glaring headlines and viral videos that demonize gays and lesbians who want to get married or serve in the military. Kids are impressionable. When they hear their parents rail against gay soldiers, it's not that hard to guess which scapegoats they'll target for their own frustrations. Hopefully, the compassionate reaction to the recent tragedies will give hope to kids who are being bullied. The very presence of the "It Gets Better" videos is a sign that there is a community waiting to welcome them when they get through school. In the meantime, some folks who were inspired by Dan Savage’s project started the Make It Better Project with the aim of giving students the tools they need to make their schools better now. One of their first actions is to rally people across the country to contact their Congresspeople this Tuesday, October 12, and urge them to vote for the Safe Schools Improvement Act and the Student Non-Discrimination Act to end bullying.